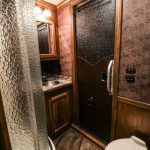 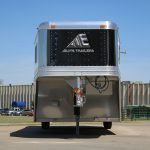 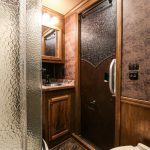 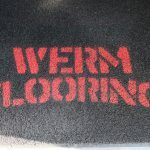 With full length, extruded sides and smooth white or black sheets above, this trailer stands out against the competition with its rugged good looks. 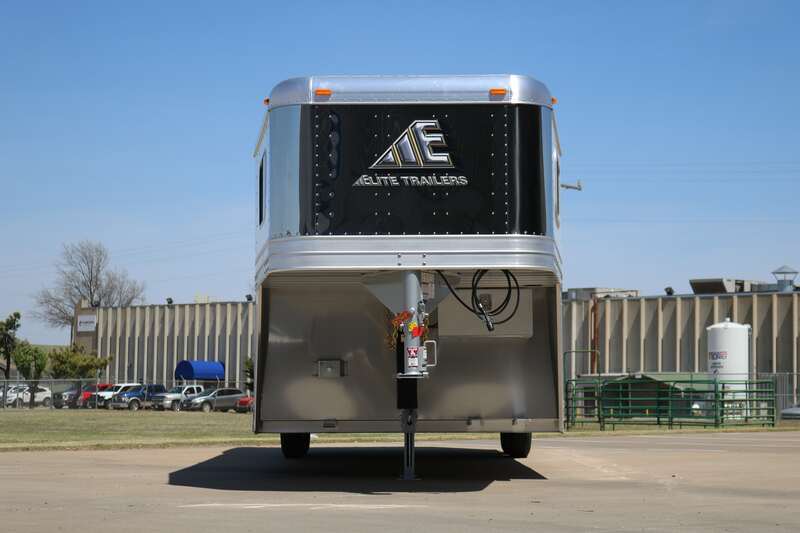 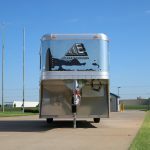 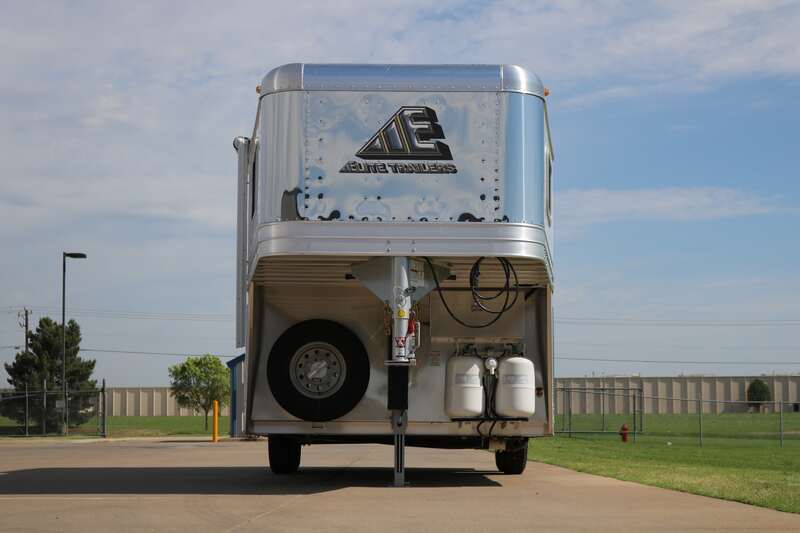 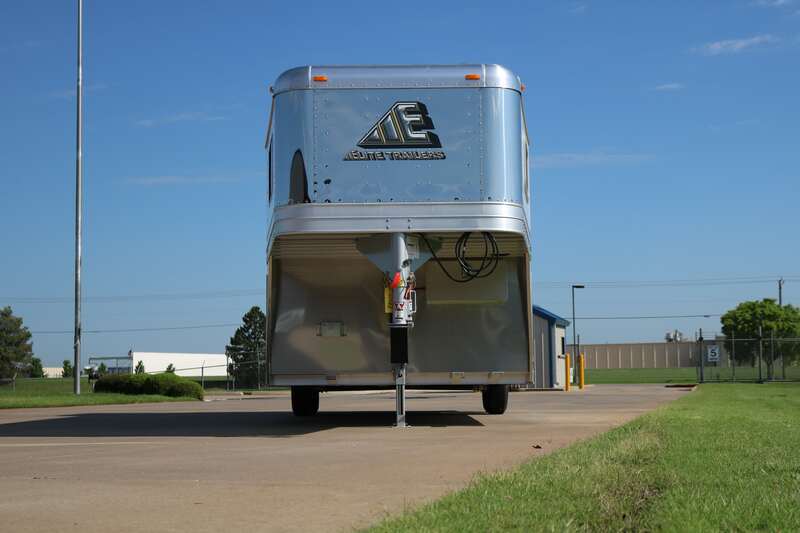 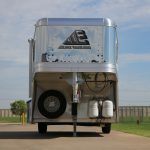 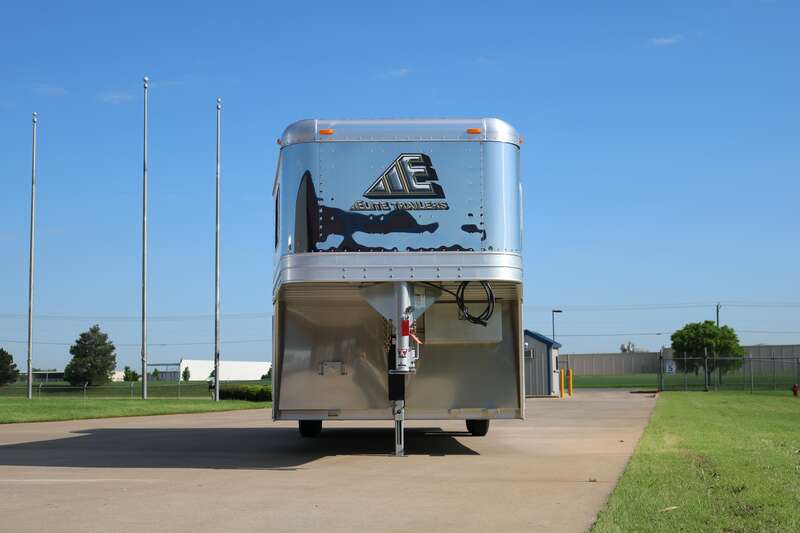 Built with the same structure as our custom trailers, this 8' wide, 7' 6" height production model is loaded with features that you are looking for and the durability that you would expect from Elite. 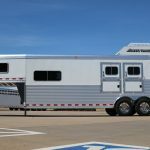 Available in a 2, 3 and 4 Horse model, featuring an 8' 8" layout or multiple layout choices on a 10' 8" short wall living quarters. 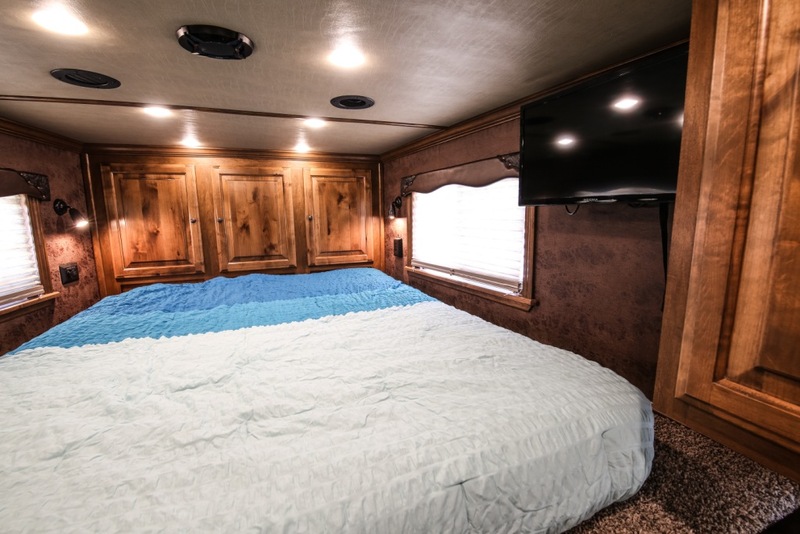 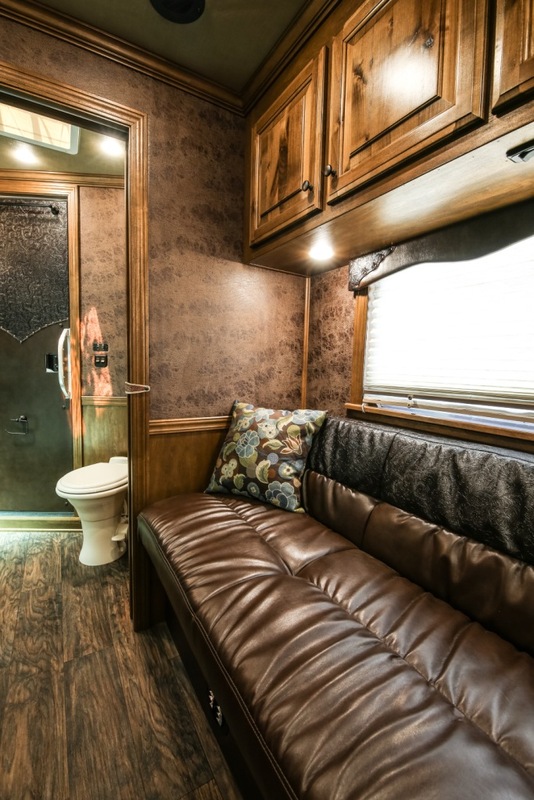 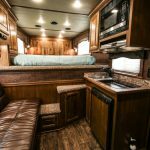 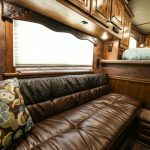 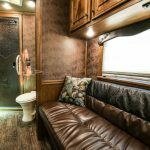 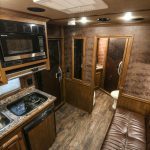 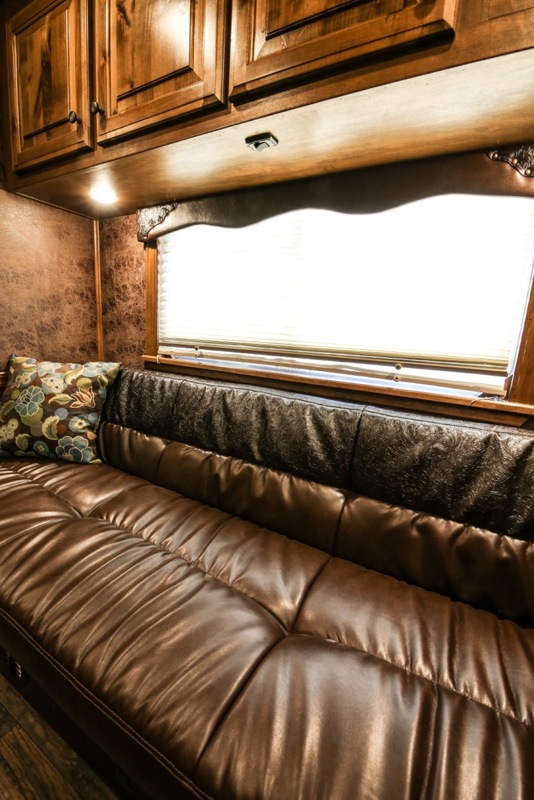 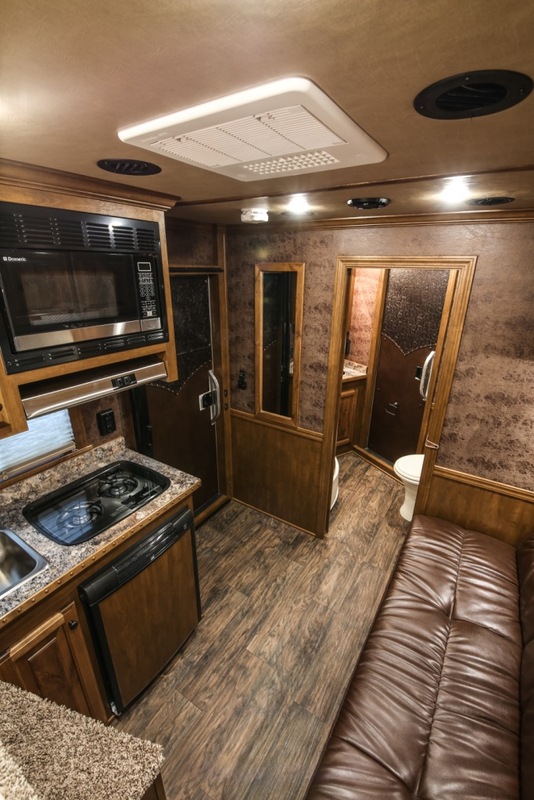 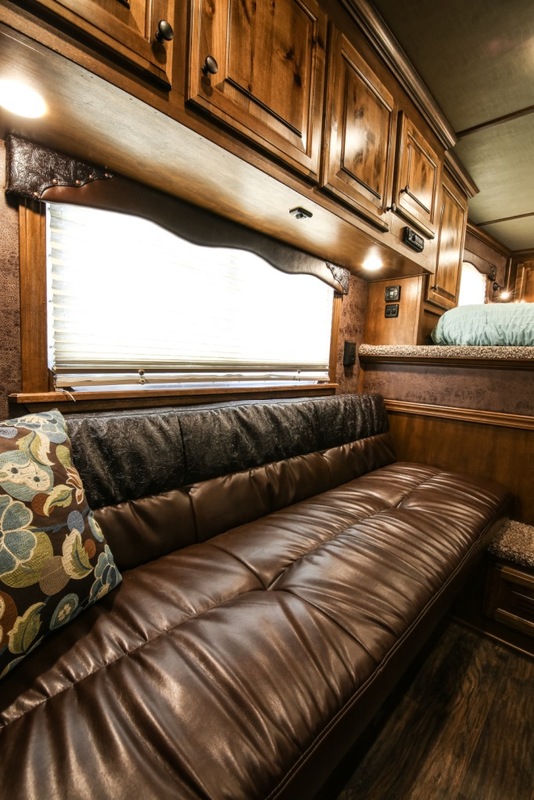 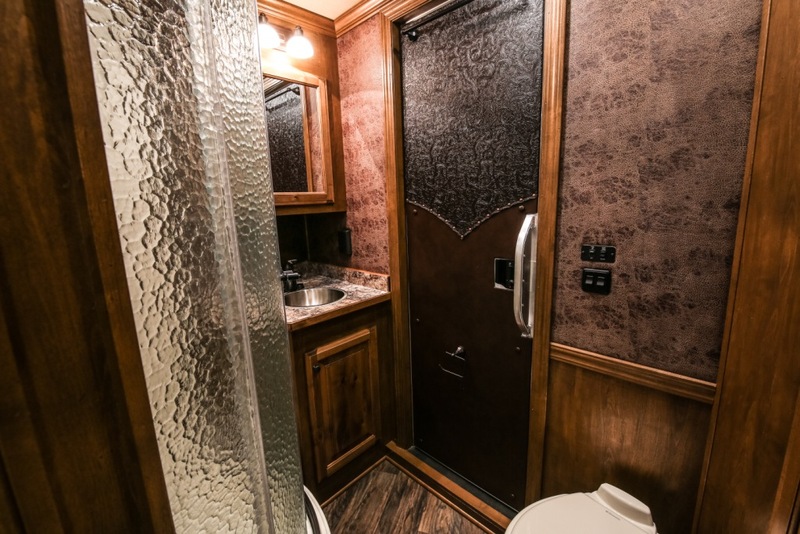 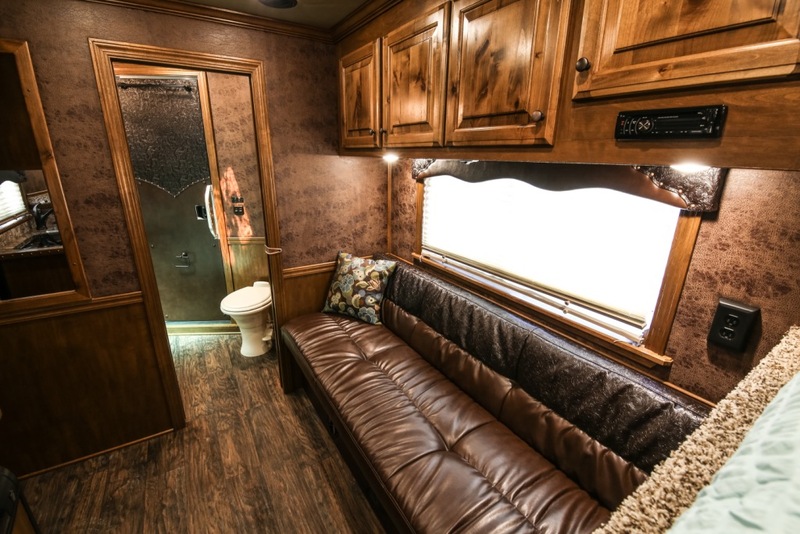 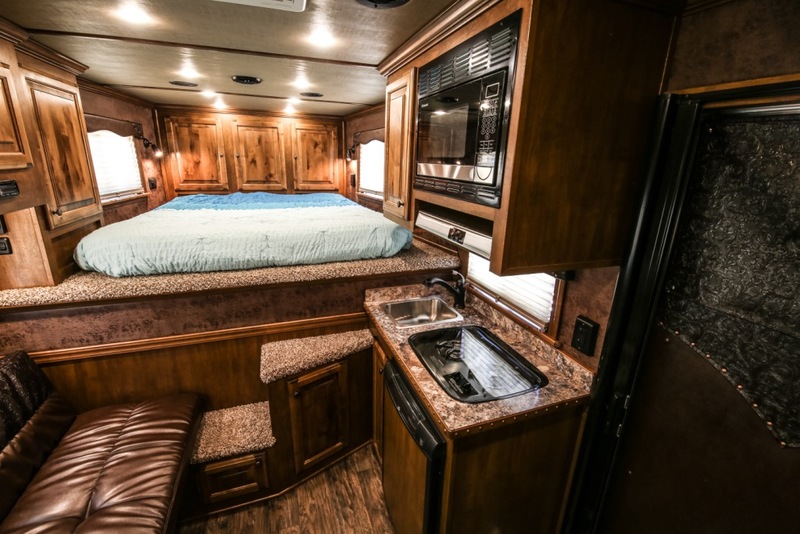 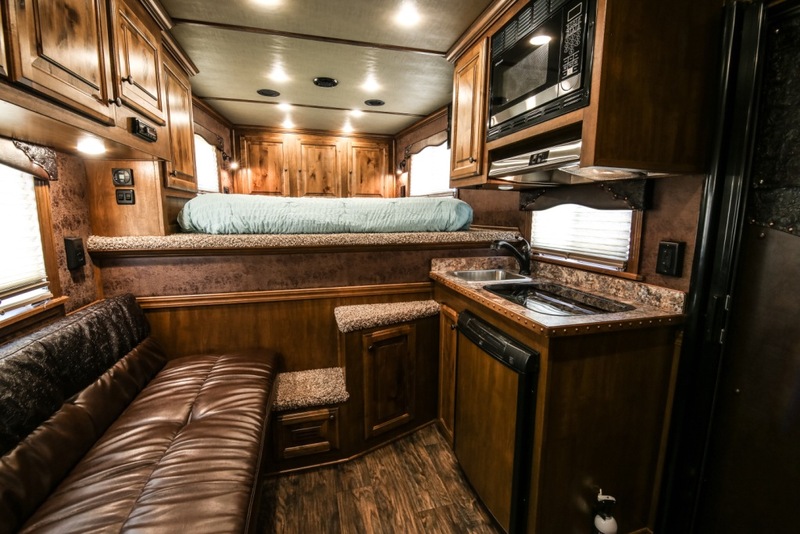 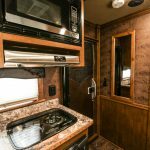 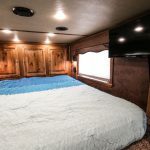 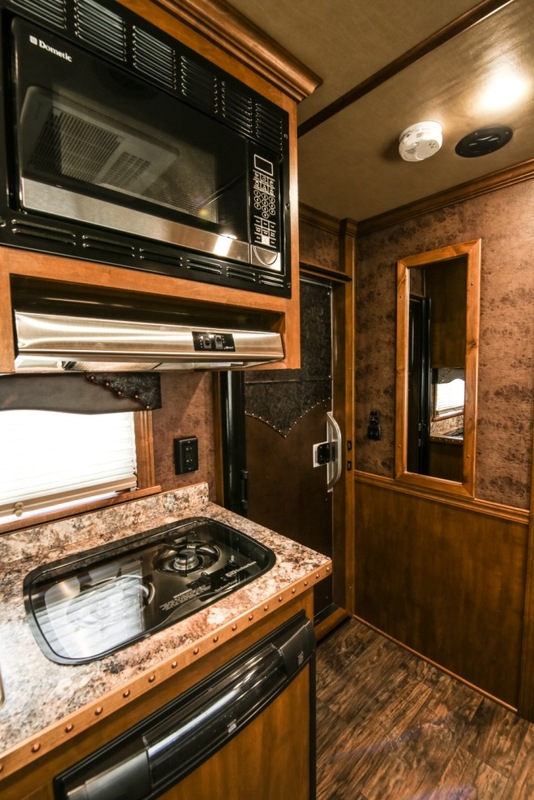 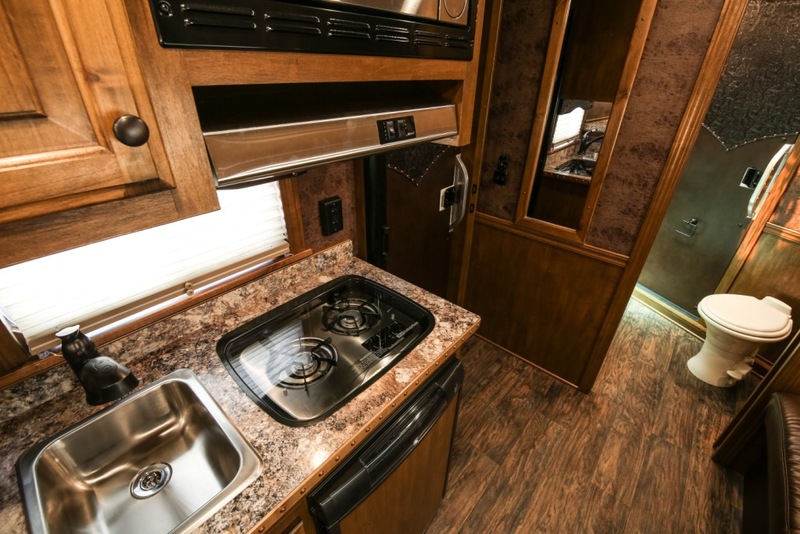 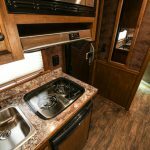 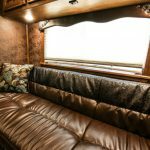 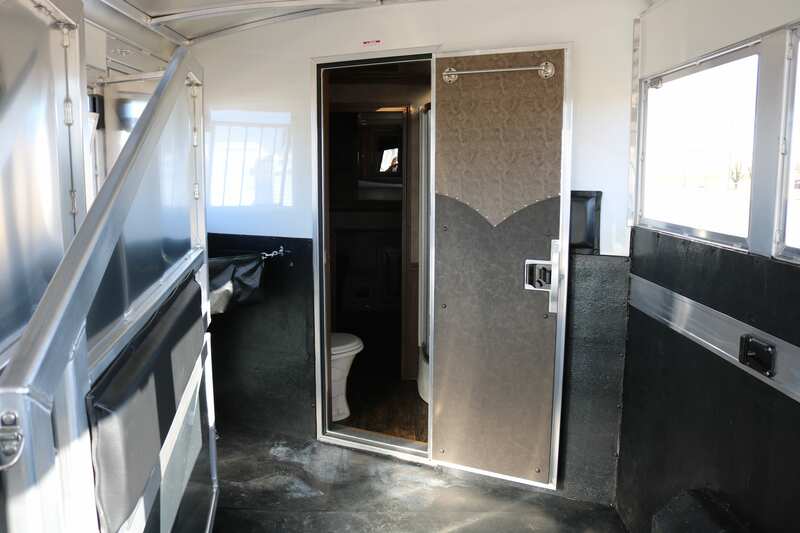 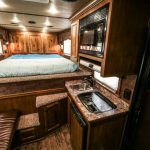 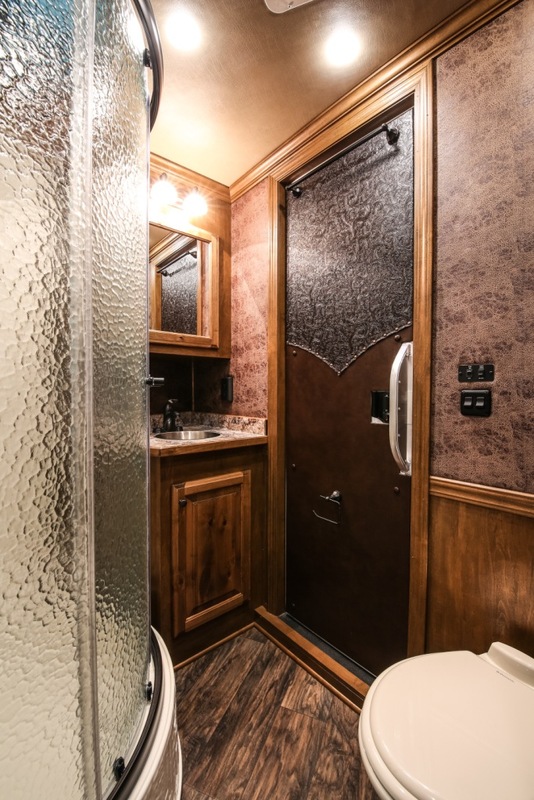 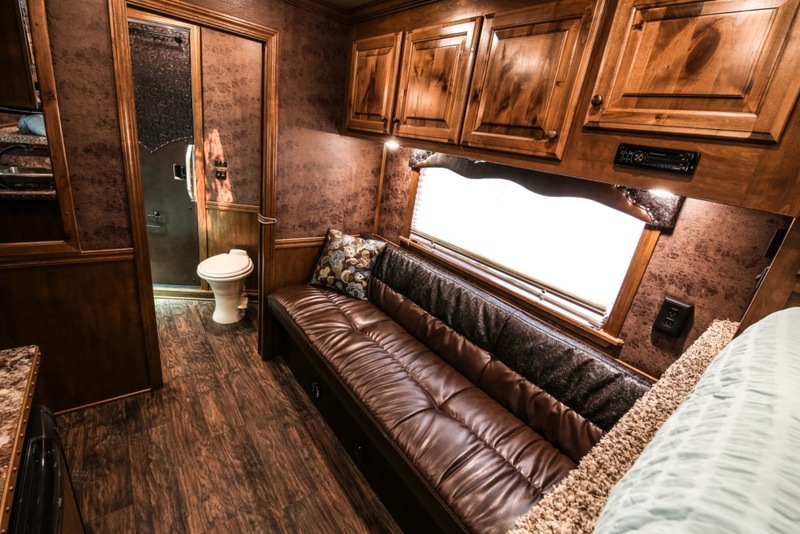 The Mustang LQ has all the amenities that you will need including sofa or dinette, air conditioner, ducted heat, microwave, refrigerator, large bathroom with radius shower and plenty of storage. 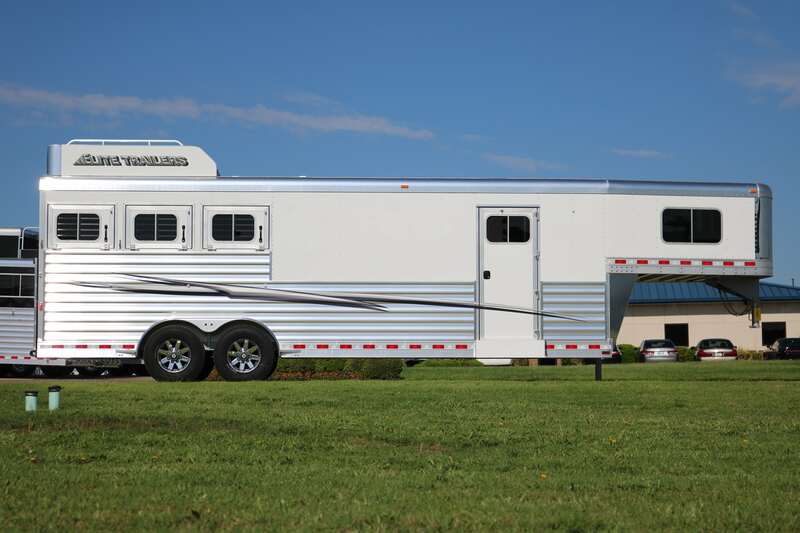 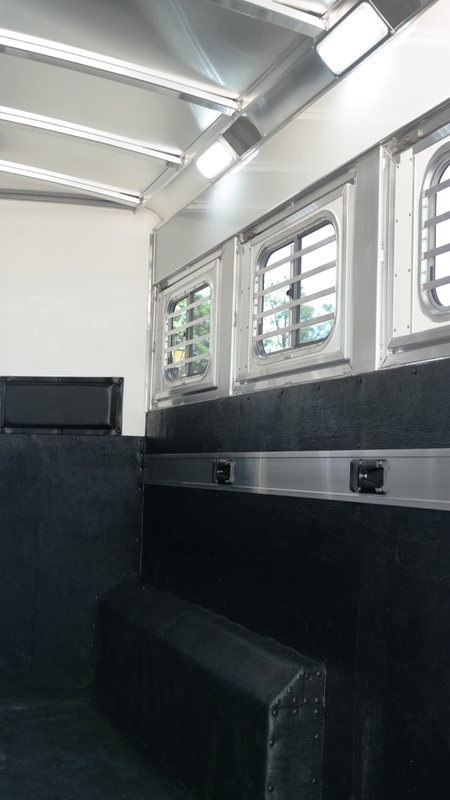 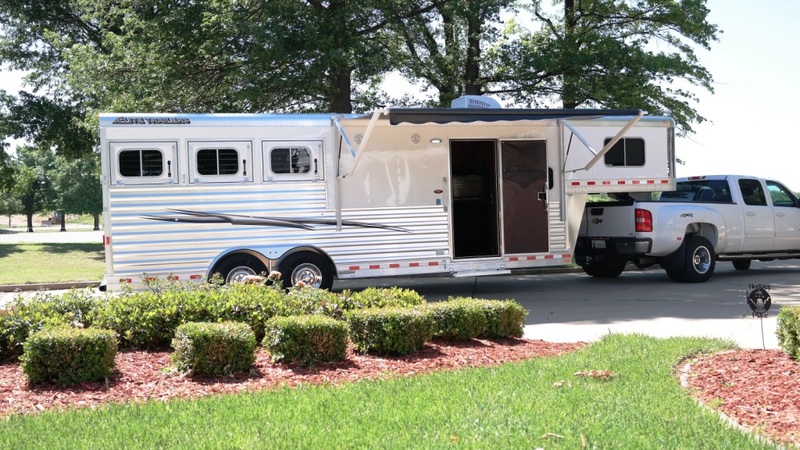 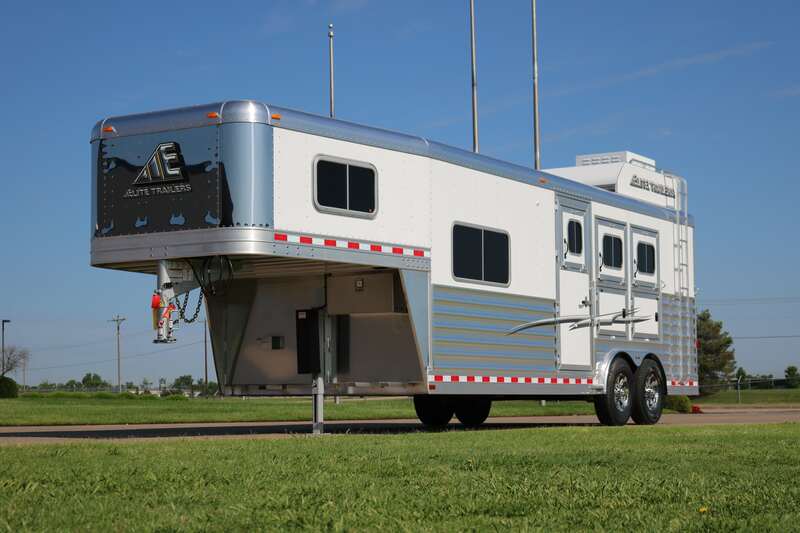 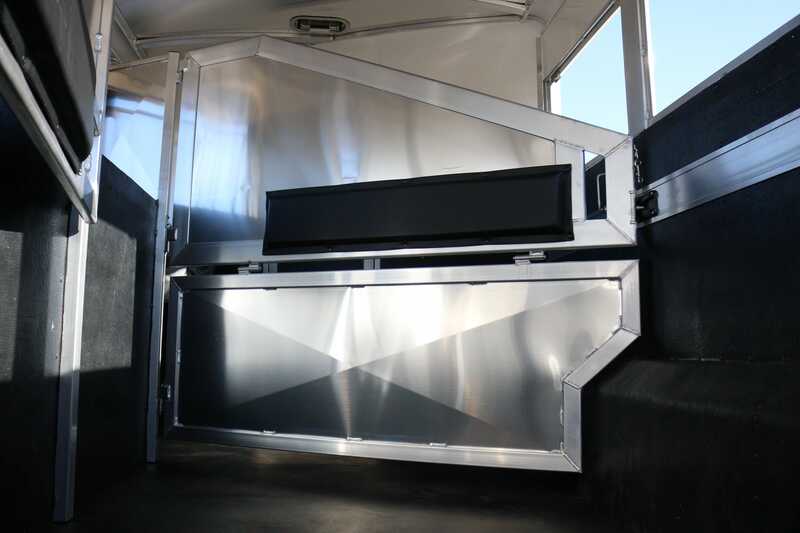 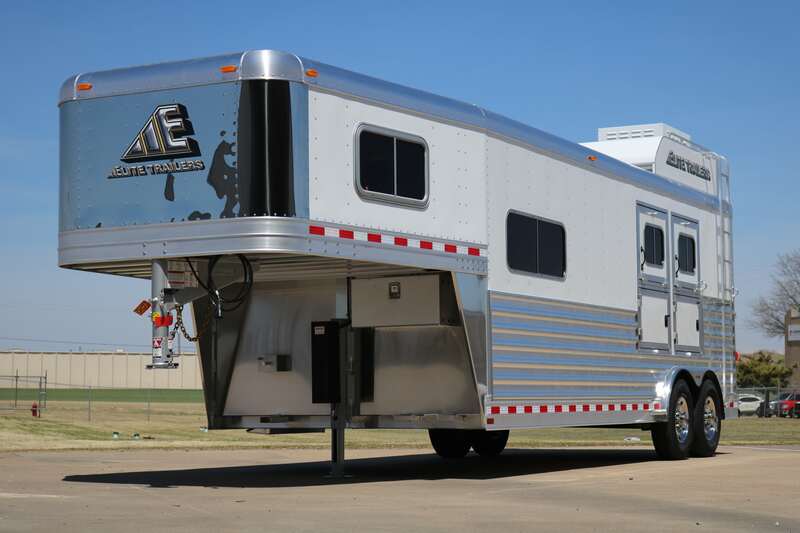 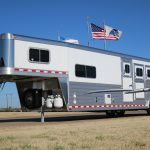 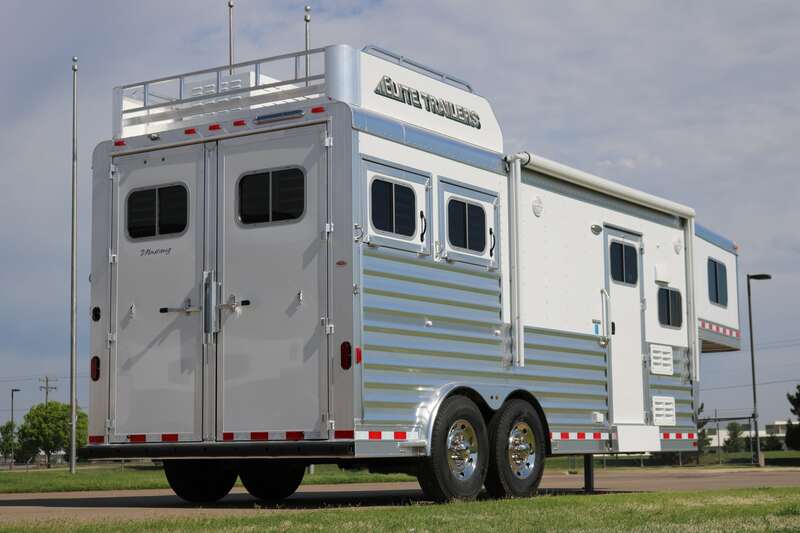 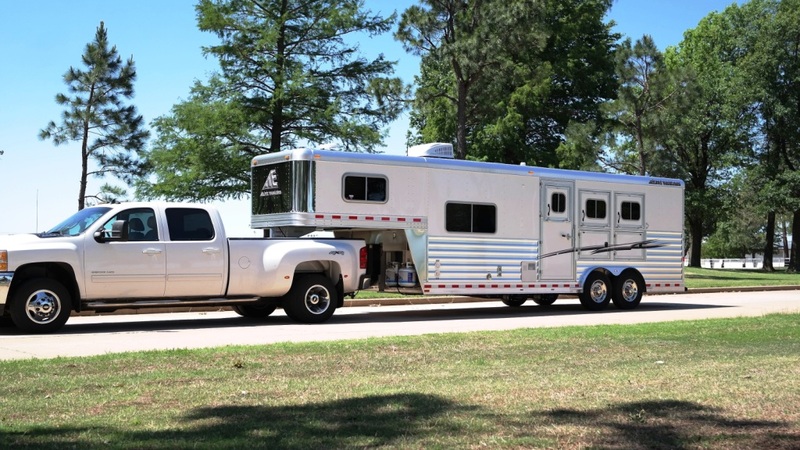 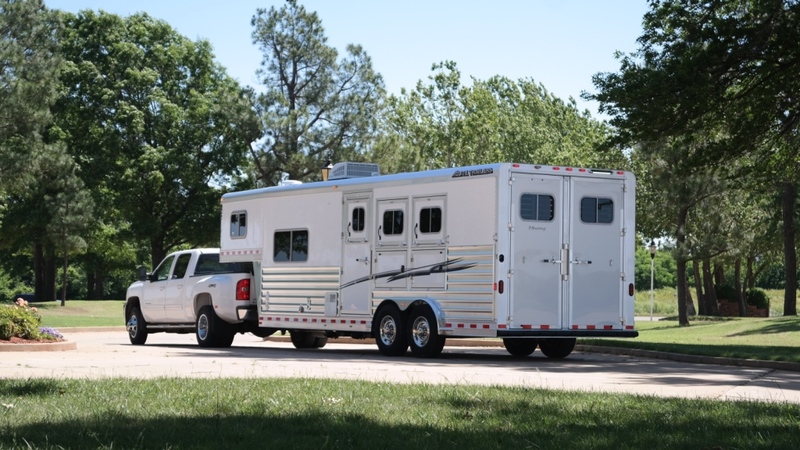 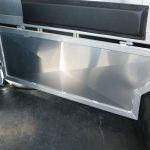 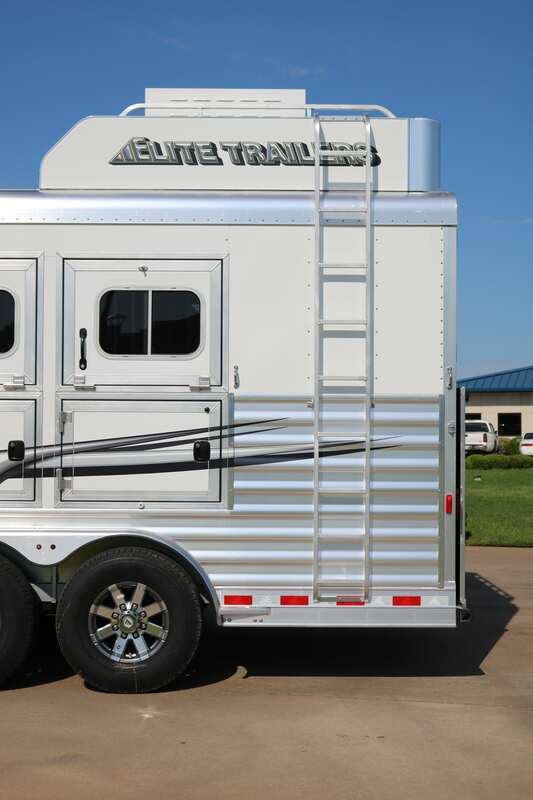 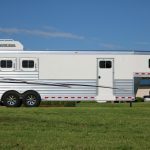 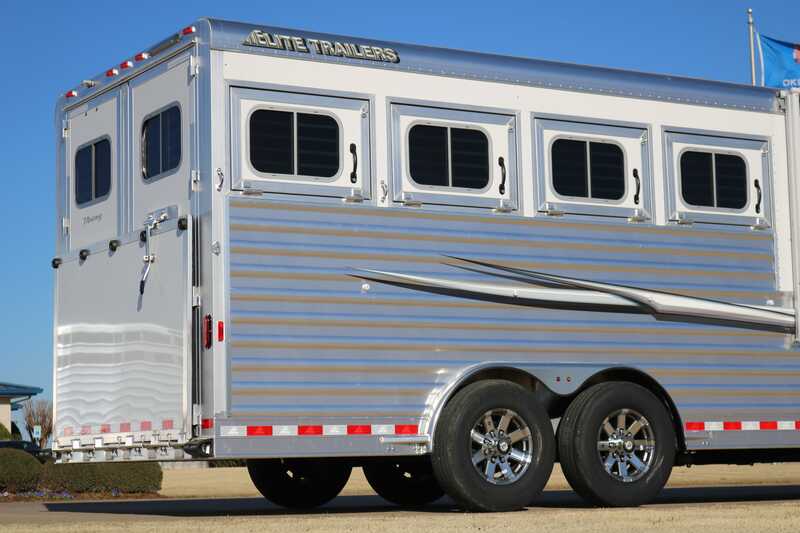 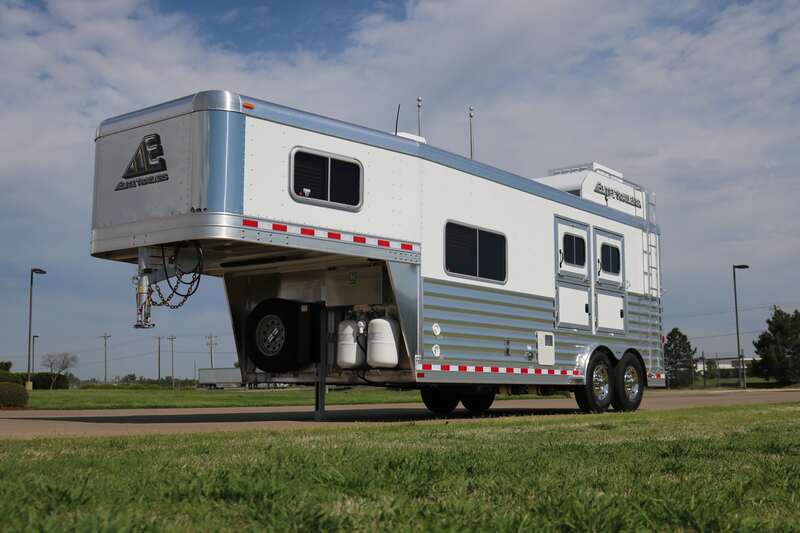 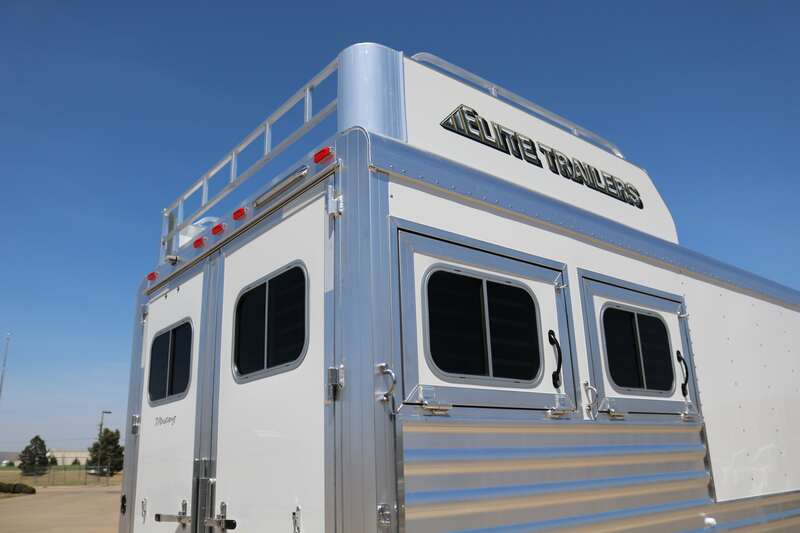 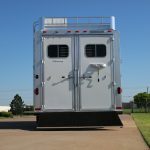 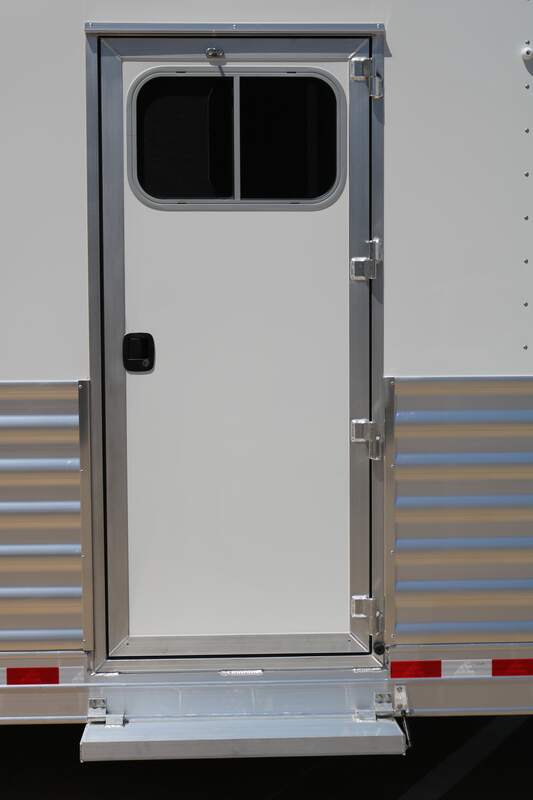 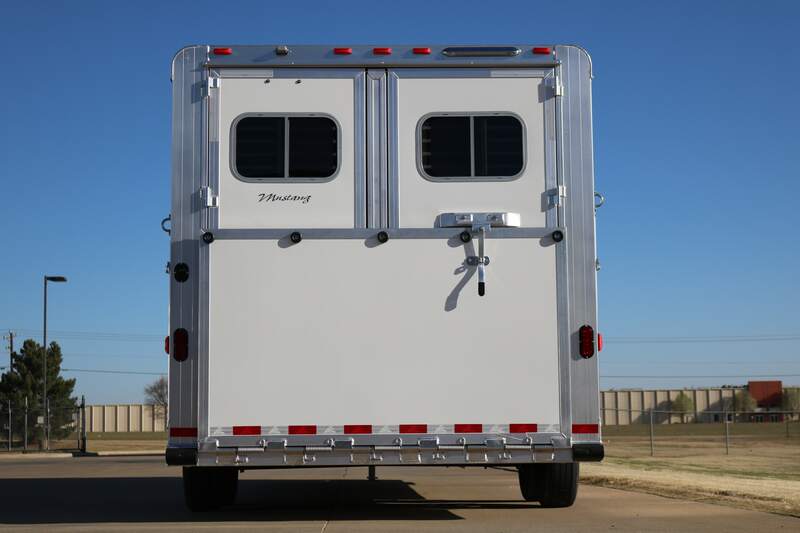 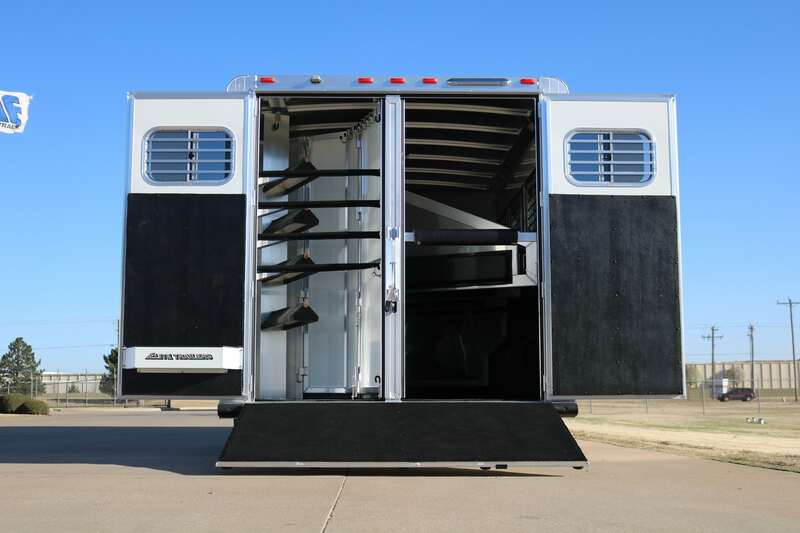 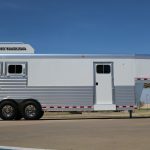 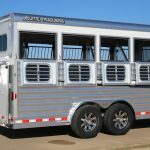 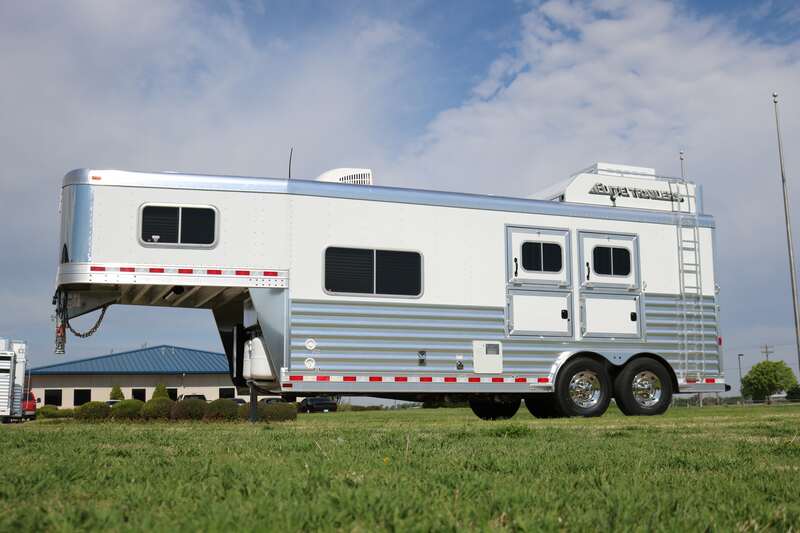 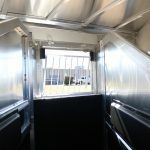 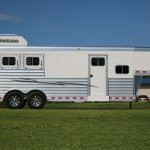 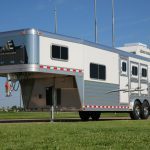 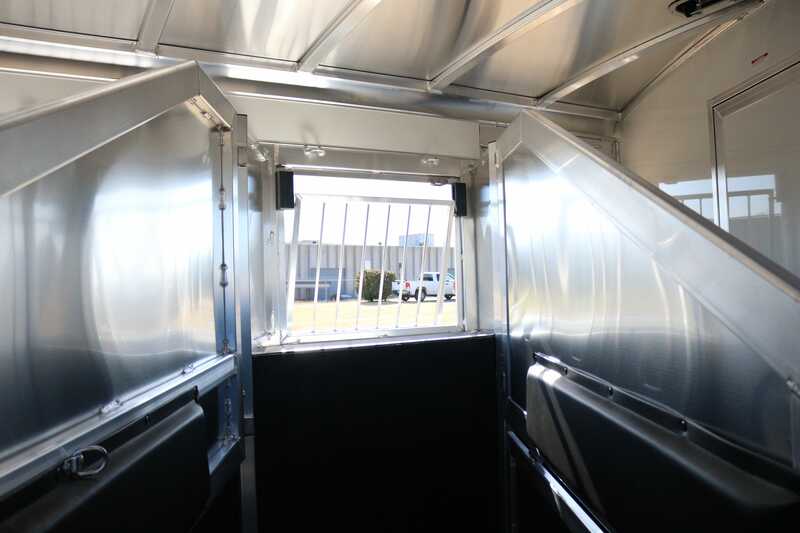 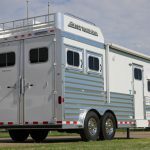 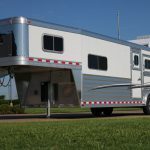 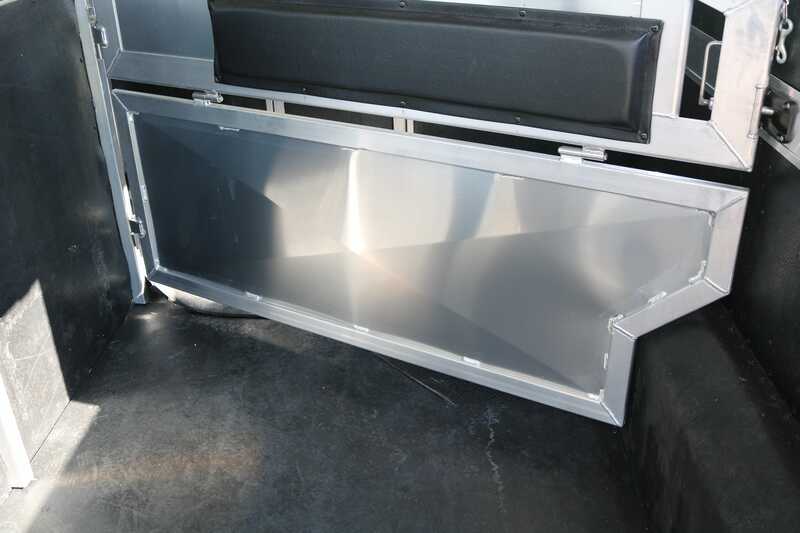 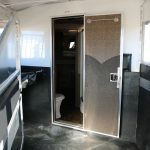 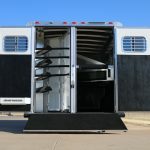 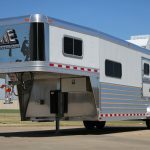 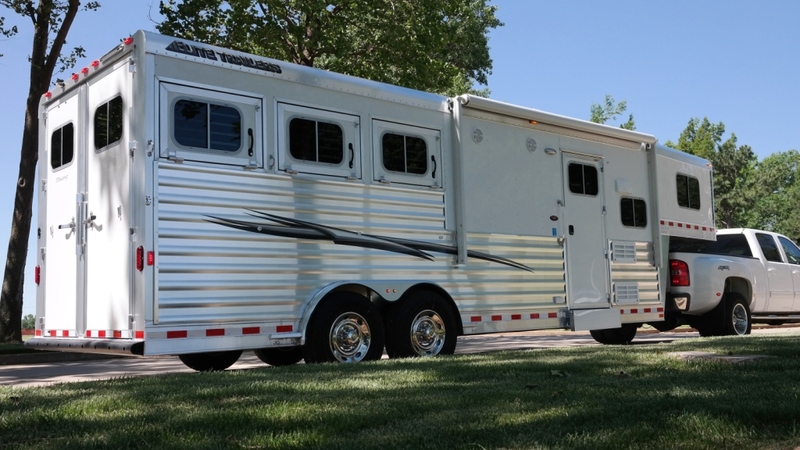 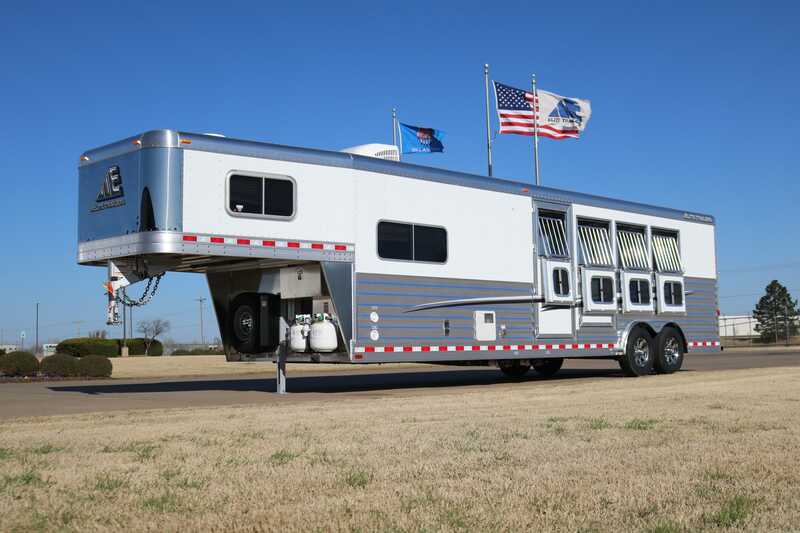 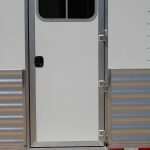 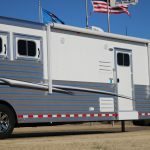 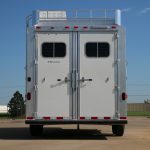 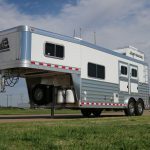 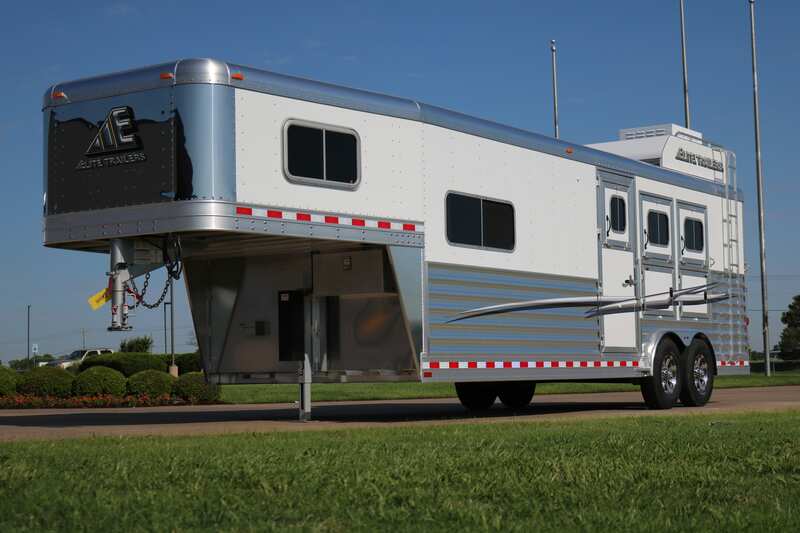 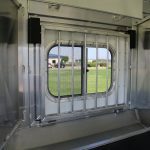 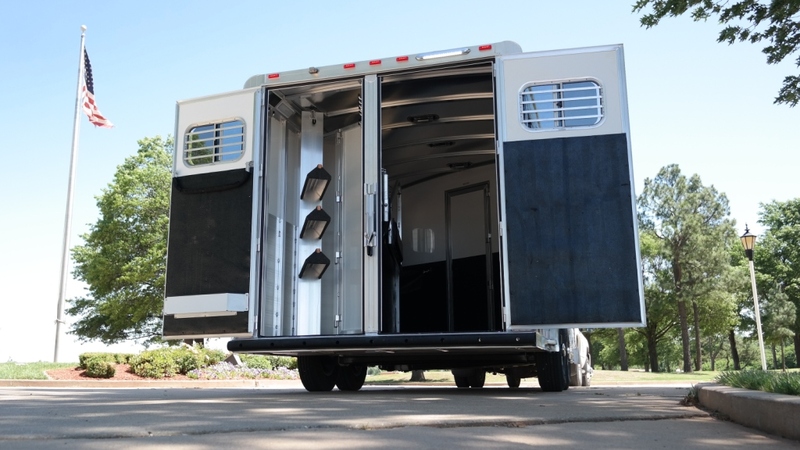 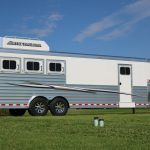 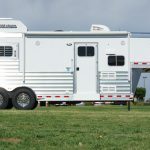 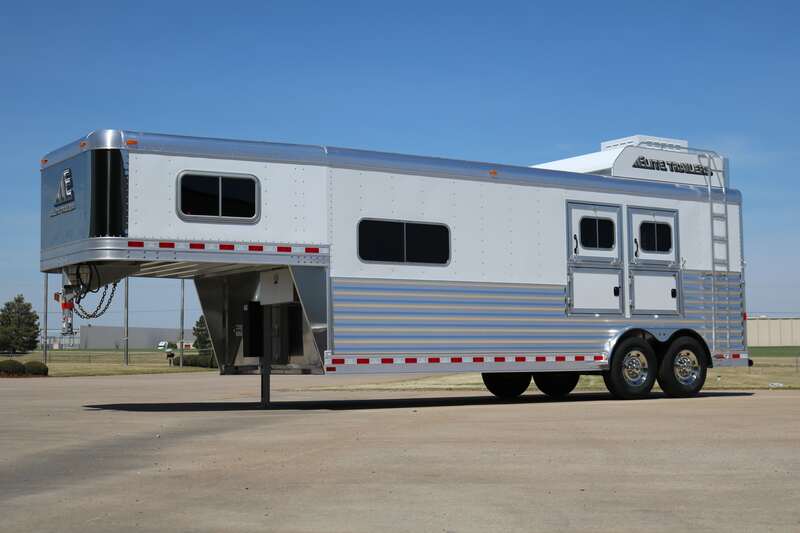 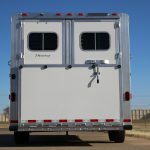 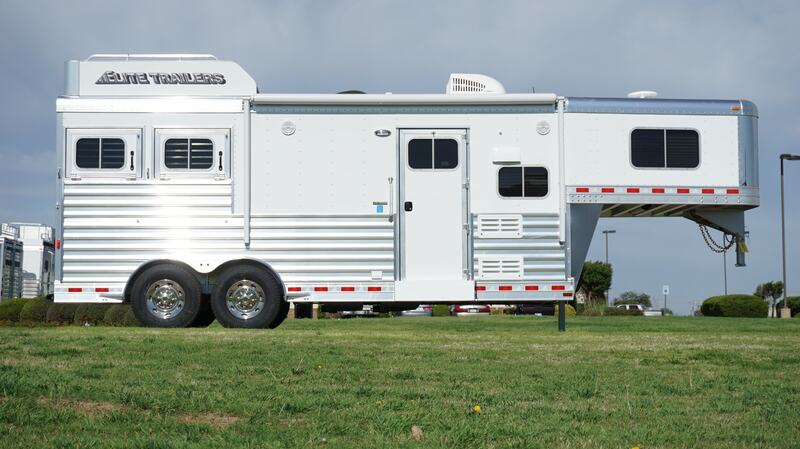 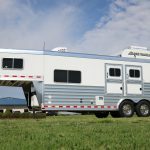 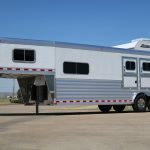 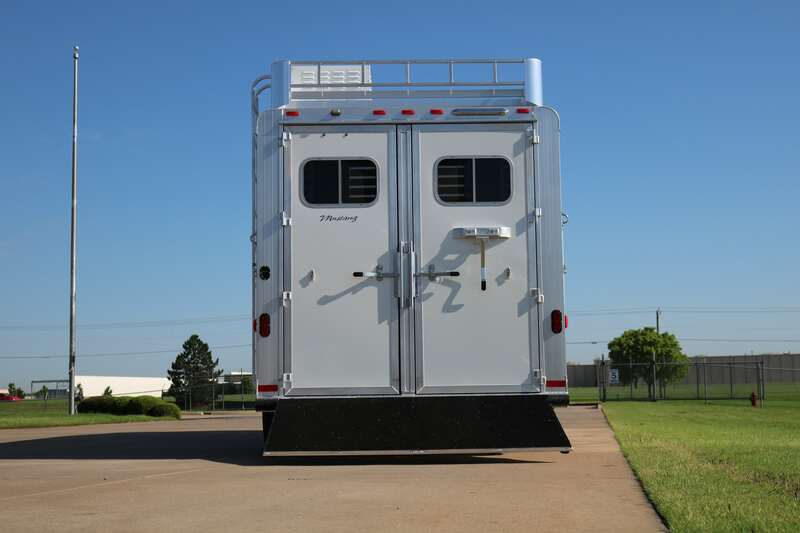 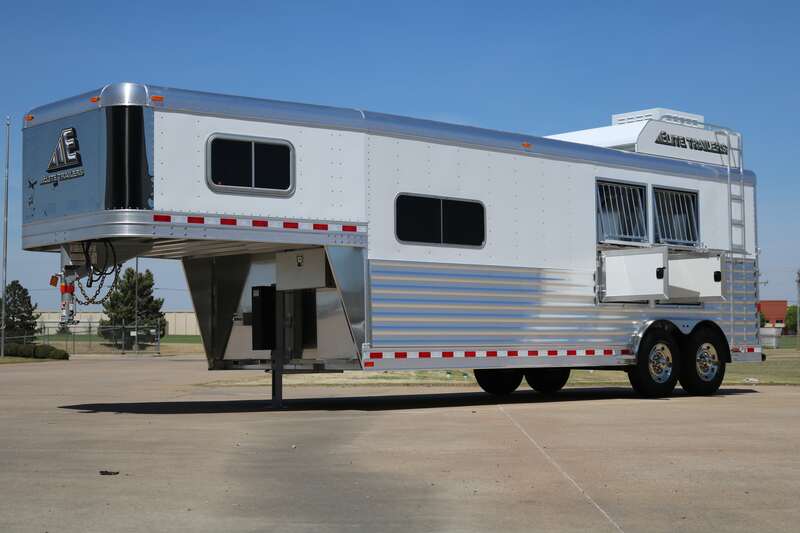 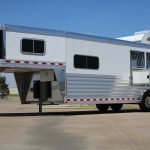 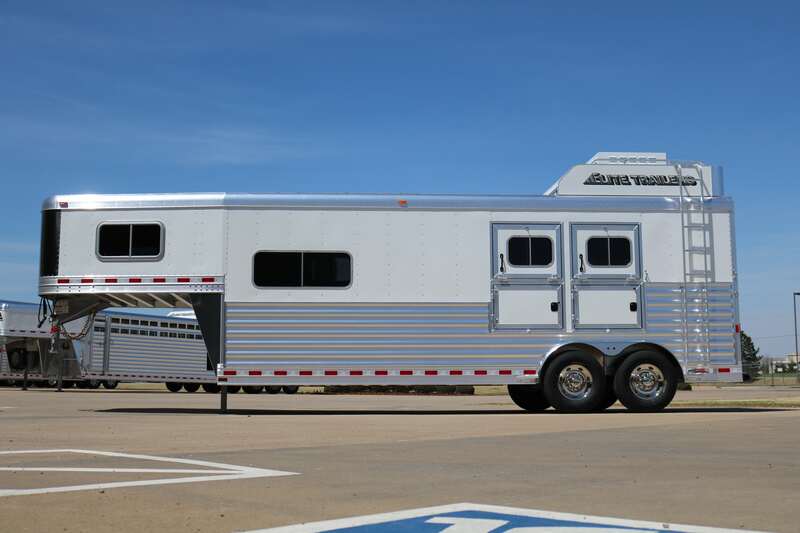 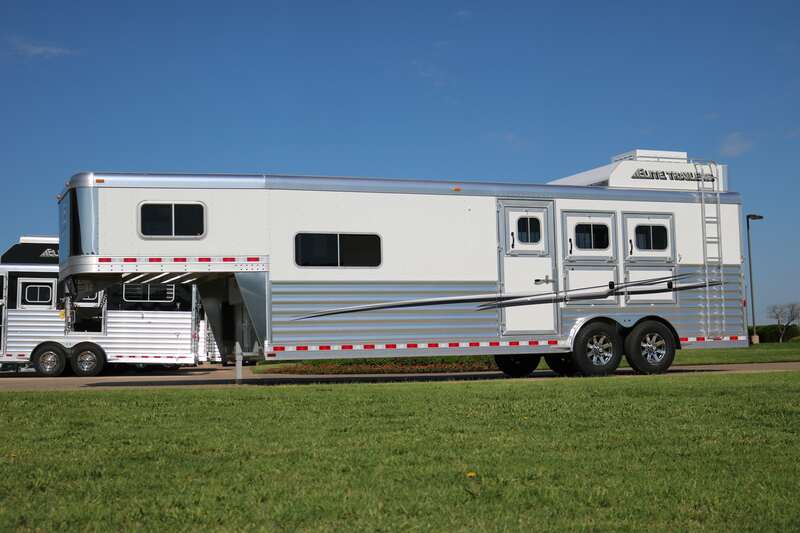 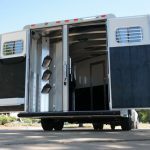 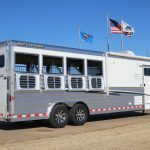 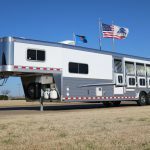 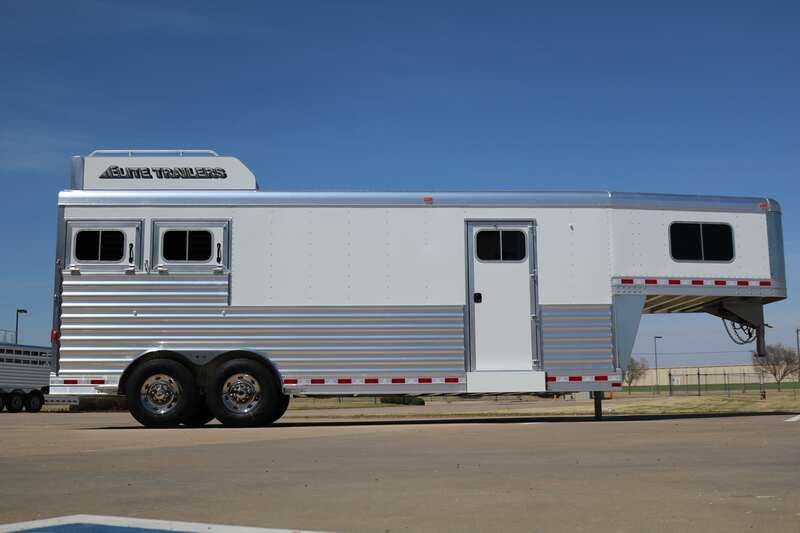 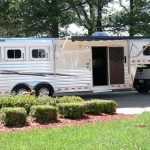 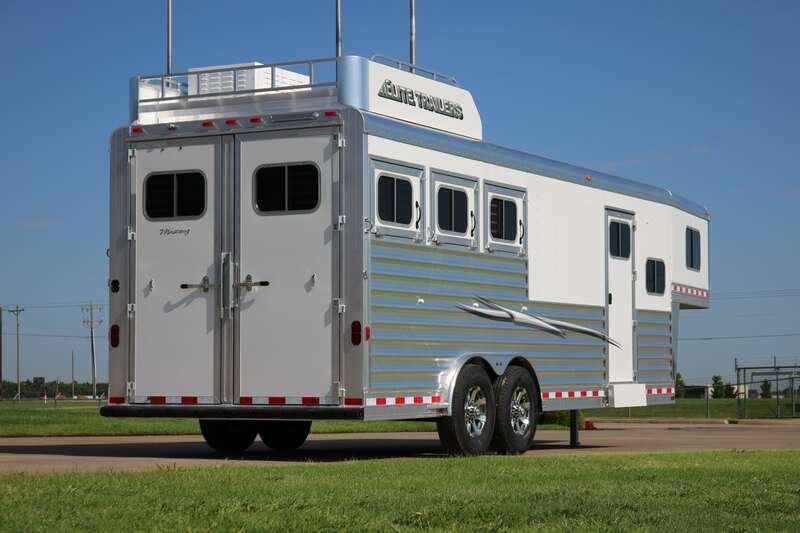 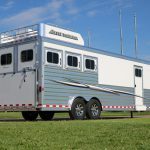 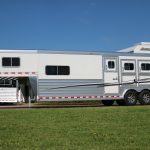 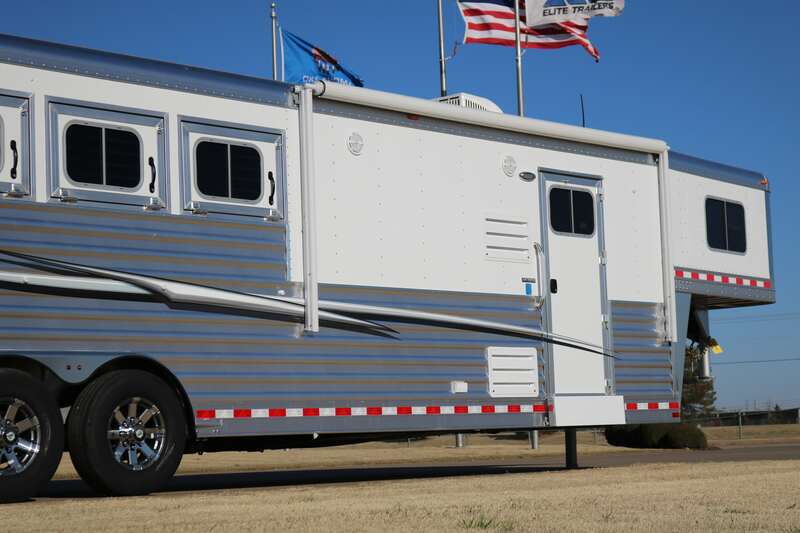 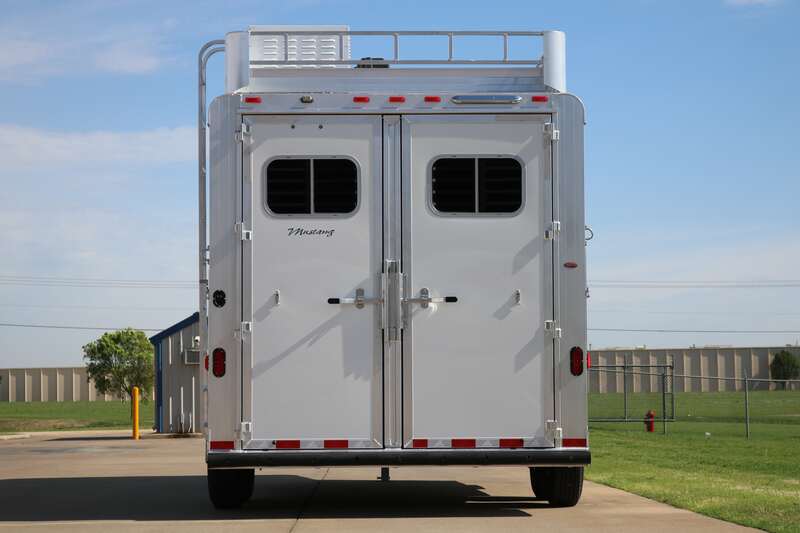 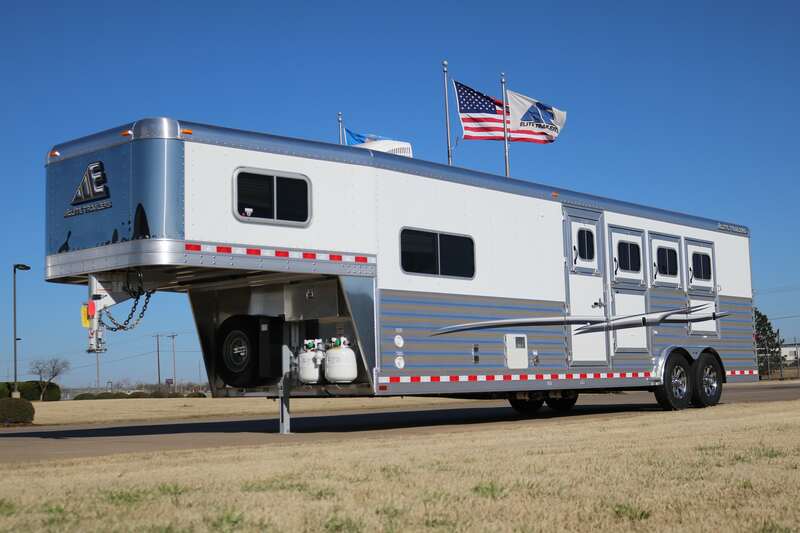 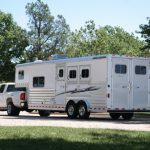 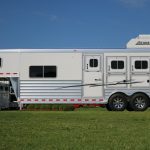 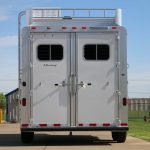 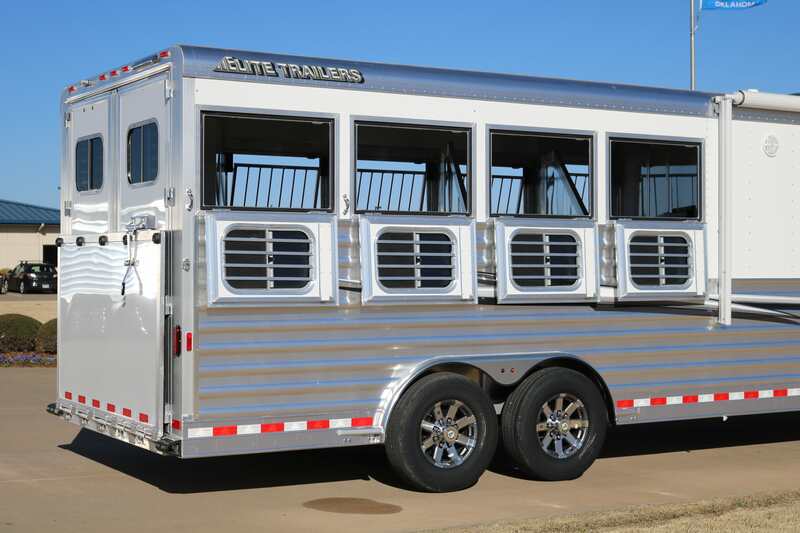 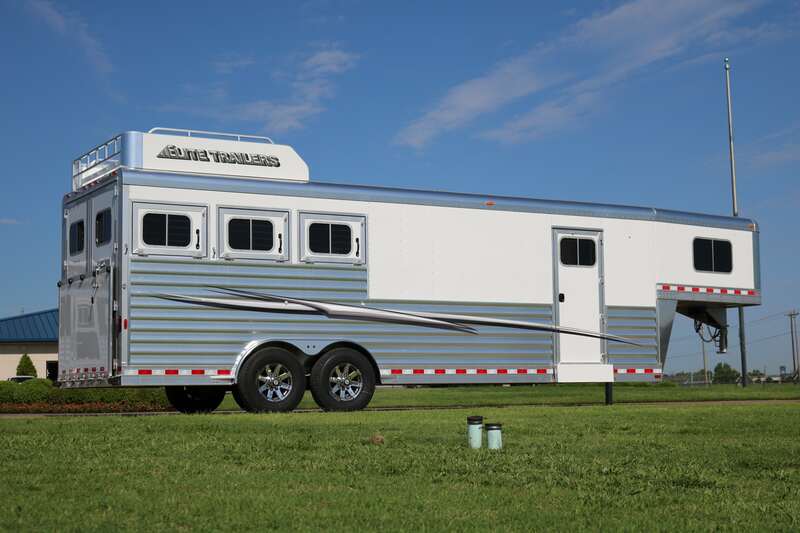 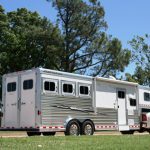 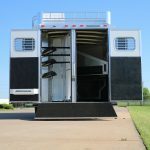 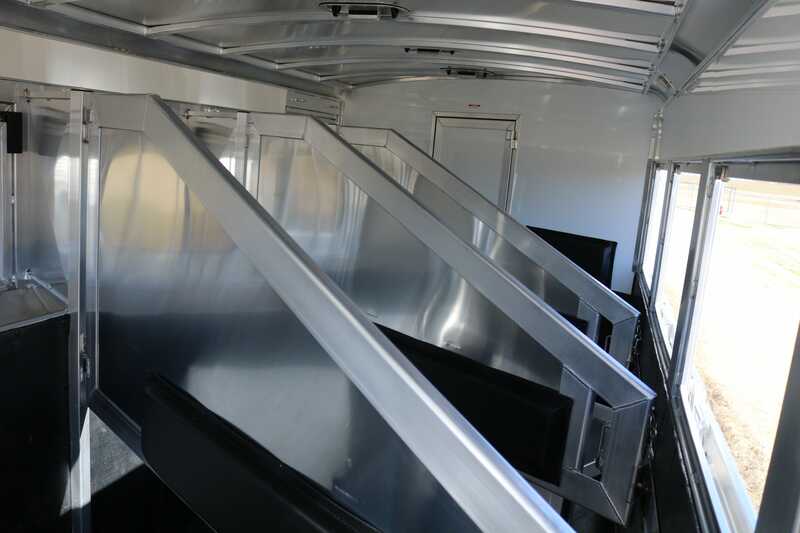 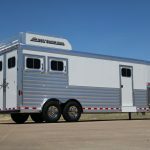 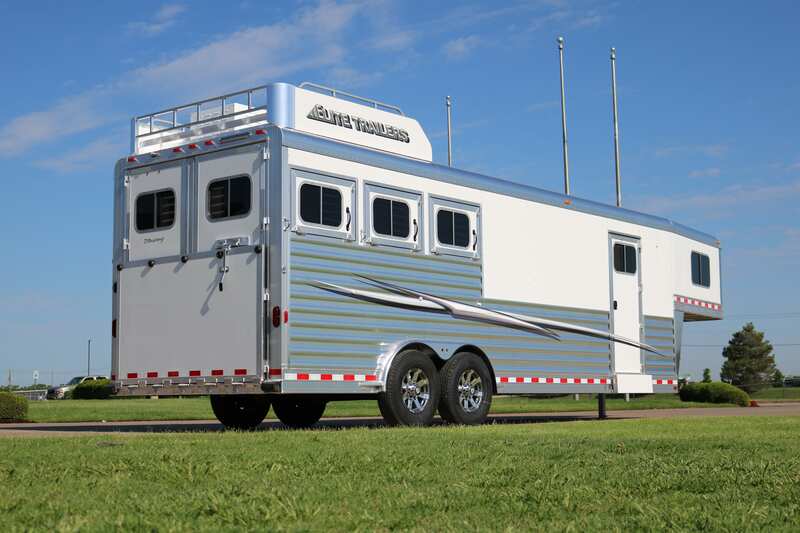 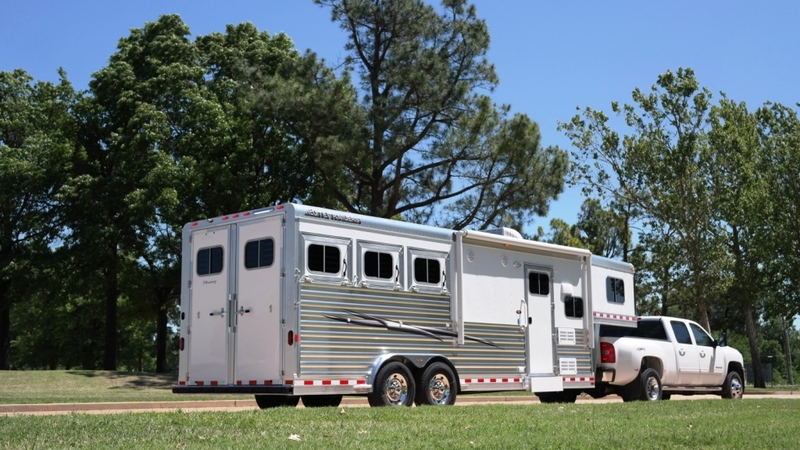 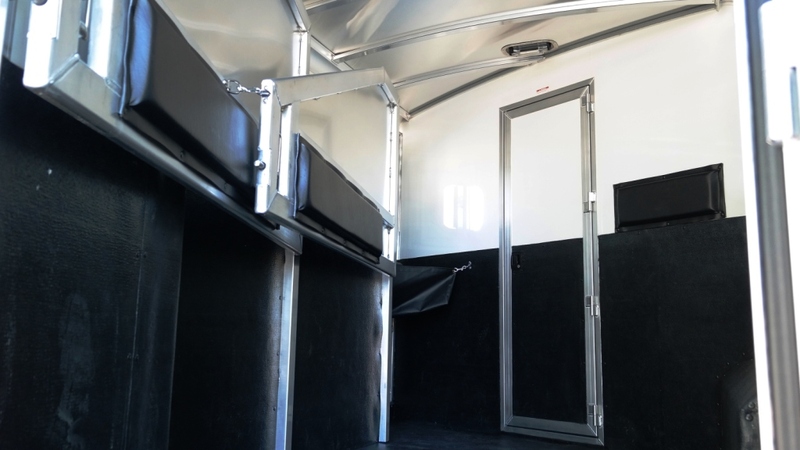 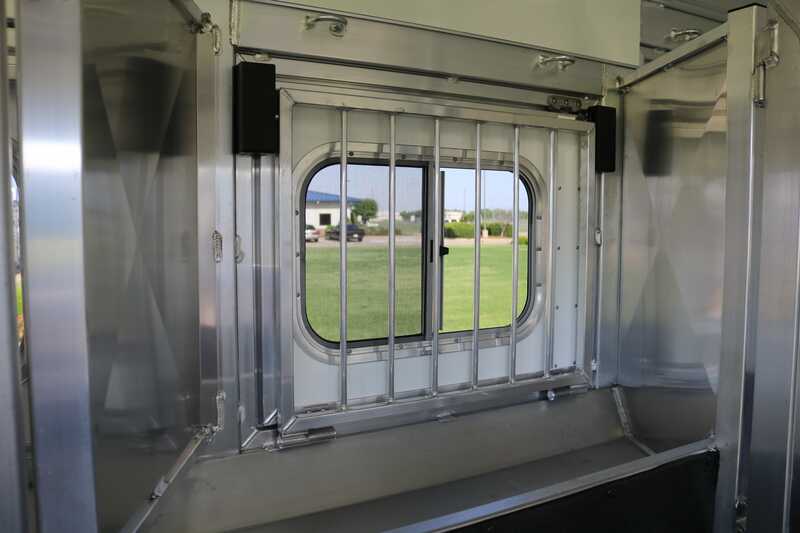 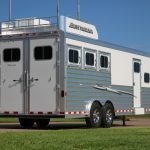 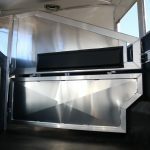 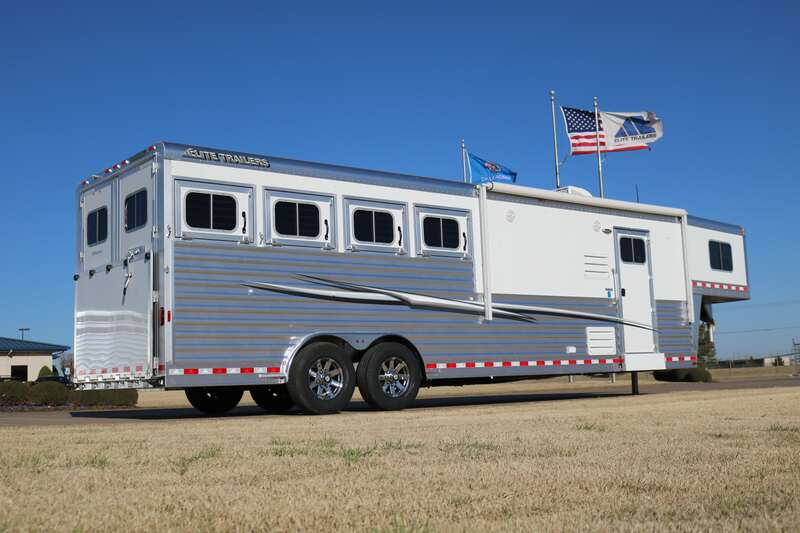 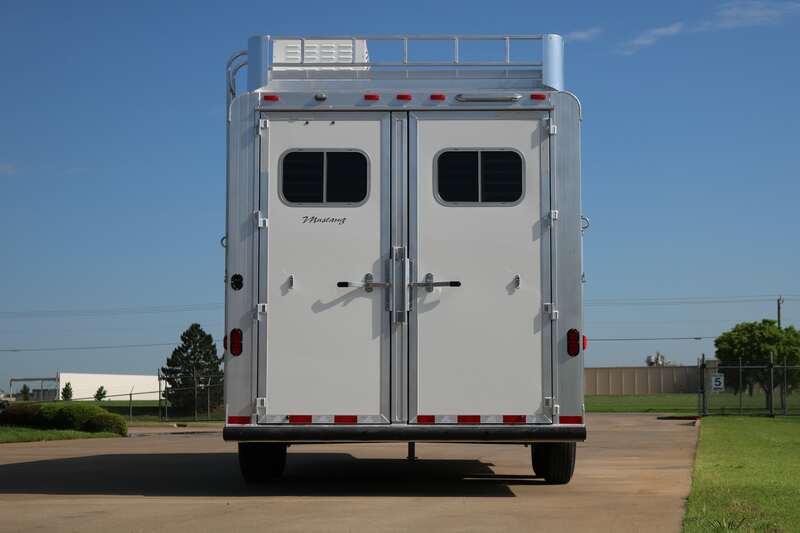 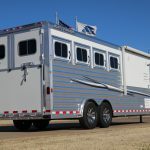 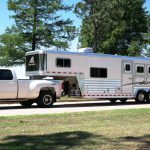 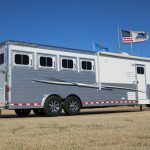 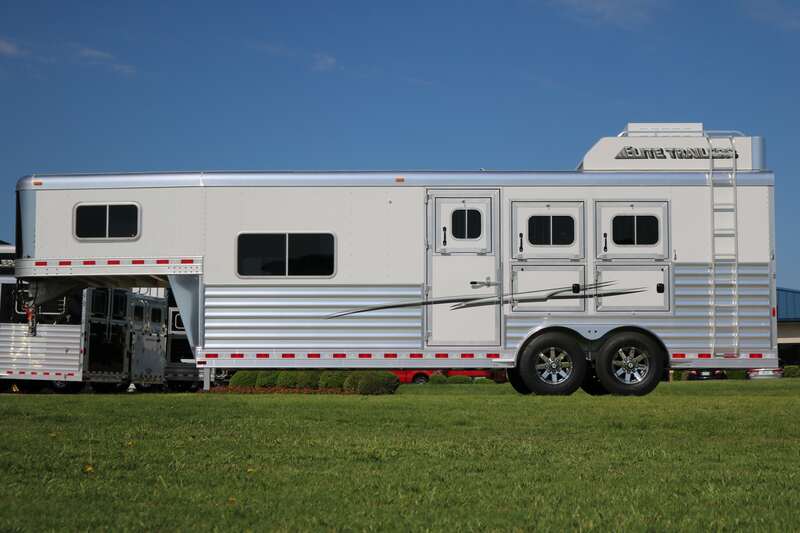 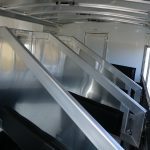 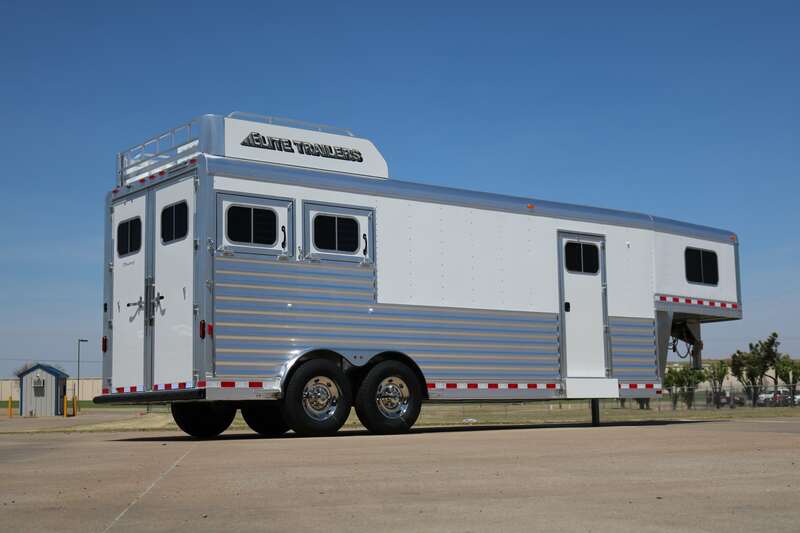 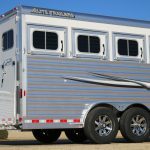 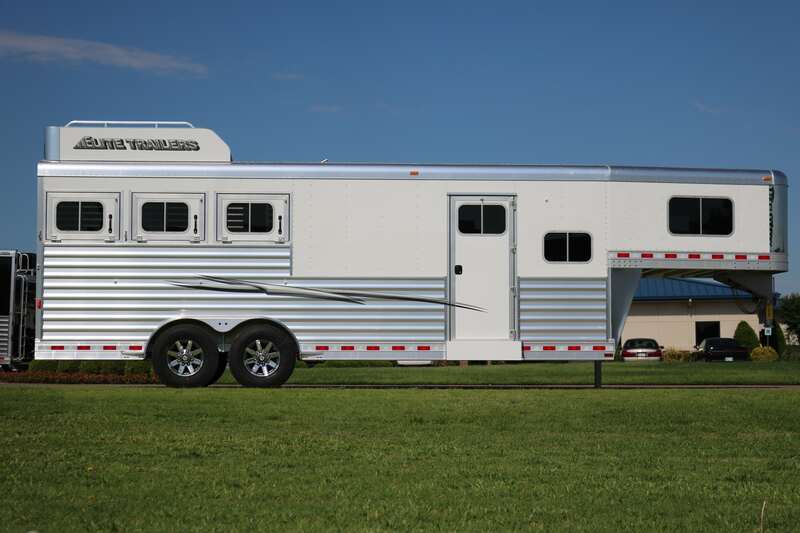 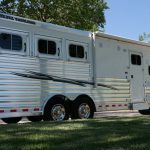 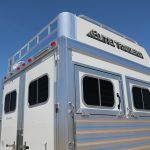 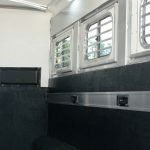 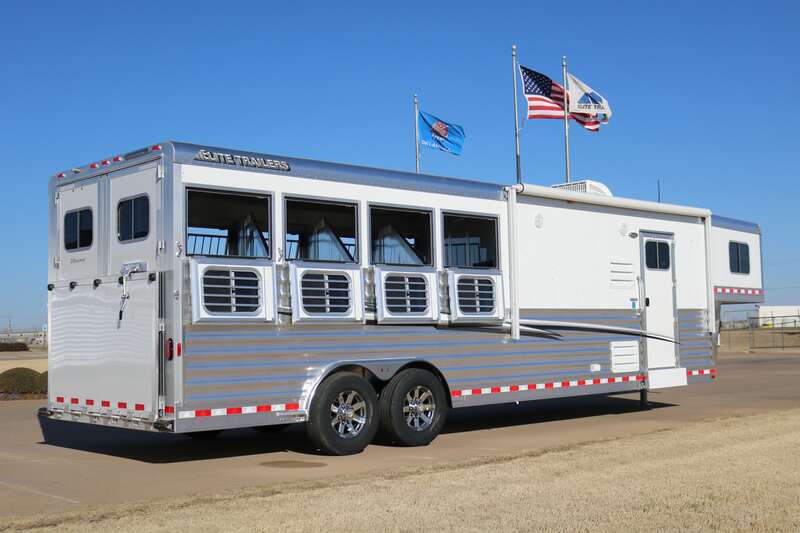 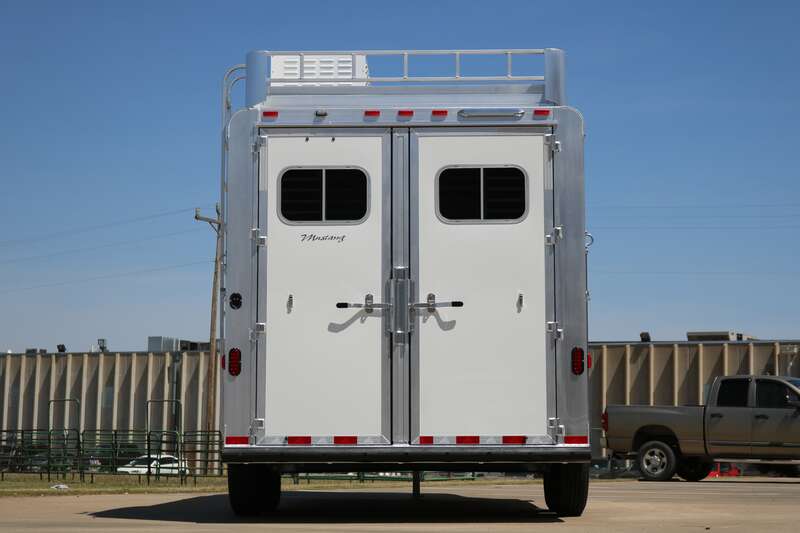 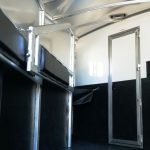 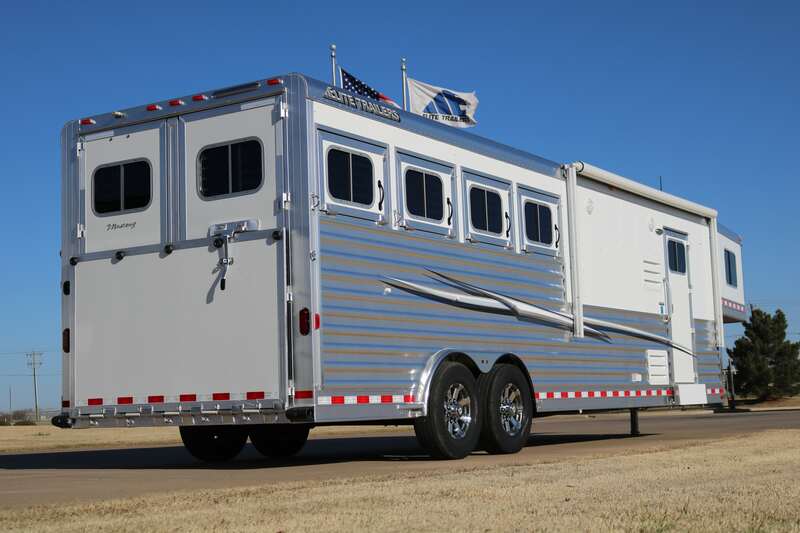 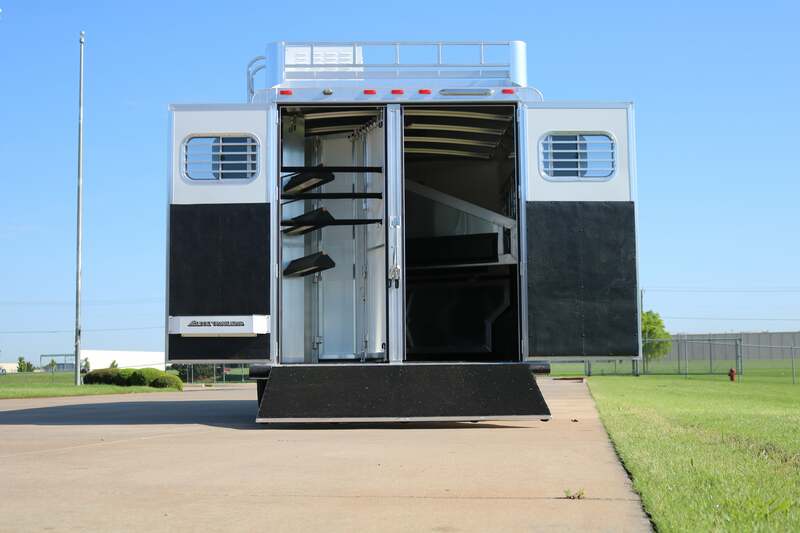 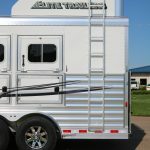 Trailer features include drop down feed doors with the new Mustang drop bars on streetside and drop down doors on curbside, streetside escape door at the 1st horse, mangers with exterior access doors to storage under manger, collapsible rear tack and much more. 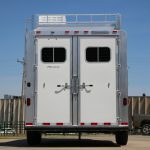 One Layout Available on 8' 8" with (4) Four Layouts Available on 10' 8"
2 Horse Mustang LQ with 8'8" LQ8'19'4"7'6"
2 Horse Mustang LQ with 10'8" LQ8'21'4"7'6"
3 Horse Mustang LQ with 8'8" LQ8'22'8"7'6"
3 Horse Mustang LQ with 10'8" LQ8'24'8"7'6"
4 Horse Mustang LQ with 8'8" LQ8'26'7'6"
4 Horse Mustang LQ with 10'8" LQ8'28'7'6"
2 Horse Mustang LQ 8'8"
2 Horse Mustang LQ 10'8"
3 Horse Mustang LQ 8'8"
3 Horse Mustang LQ 10'8"
4 Horse Mustang LQ 8'8"
4 Horse Mustang LQ 10'8"